SBI Senior Executive Posts Recruitment 2019, Apply online till February 11. 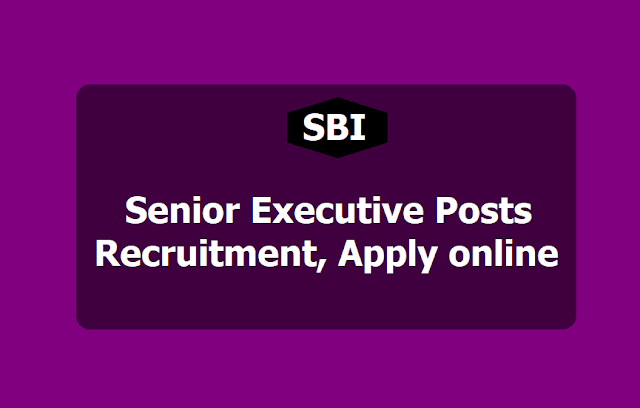 SBI Recruitment 2019 for 15 Senior Executive Posts at sbi.co.in: SBI State Bank of India, SBI has invited candides to apply for Senior Executive posts. A total of 15 Senior Executives will be filled up through this recruitment drive. Candidates willing to apply for the post can visit the official site of SBI at sbi.co.in and apply for it. The last date to apply for the job position is till February 11, 2019. SBI SE Recruitment 2019: State Bank of India has invited applications for recruitment of senior executive posts at its official website sbi.co.in/careers. There are a total of two vacancy for the post. The post is contractual in nature. Candidates can apply online at the official website before February 11, 2019. The application process began on January 22. The place of job will be Mumbai.The selection will be based on shortlisting and interview. a. Educational Qualification: Chartered Accountant / MBA (Finance)/ Master in Finance Control/ Master in Management Studies/ PGDM (Finance). b. Experience: Minimum 2 years’ post qualification experience in High Value Credit in Banks/ PSUs/ Corporates. c. Pay scale: CTC range: Rs.12.00 lacs – Rs.15.00 lacs with annual increment of 10% on CTC. In addition to CTC, travelling expense is reimbursable. d. Application fee: Online application fees and Intimation charges (Non-refundable) is Rs 600 for General and OBC candidates and intimation charges of Rs 100 for SC/ ST/PWD candidates. Educational Qualification: Candidates should be Chartered Accountant / MBA (Finance)/ Master in Finance Control/ Master in Management Studies/ PGDM (Finance). Age Limit: Candidate should be between 25 to 35 years of age. Experience: Candidate should have minimum 2 years’ post qualification experience in High-Value Credit in Banks/ PSUs/ Corporates. Candidates will be shortlisted and called for interview. Shortlisting & interview will be provisional without verification of documents. The recruitment is completely on a contractual basis and the CTC range is between Rs 12.00 lacs to Rs 15.00 lacs with an annual increment of 10% on CTC. Candidates applying for the position will have to pay Rs 600/- as application fee if belonging to General and OBC category and Rs 100/- if from SC/ST/PWD. For other details, candidates can visit the official notification for more details. About: State Bank of India, India's largest and leading commercial Bank, is looking for qualified and experienced candidate for the position of Senior Executive (Compliance) on contractual basis at its Corporate Centre, Mumbai. Candidates to visit Bank's website www.statebankofindia.com or www.sbi.co.in and open appropriate Online Application Format, available in the 'Careers with us' link. Application Process: Candidate will be required to register themselves online through Bank's website. Top Fashion Design Colleges in Pune are aligned further with the business and technical observes in the course. Making and protest of the collections and holding stage fashion demonstration is the important part of the course. The programs may reinforce the required ability of the college students.